Loch Lomond and The Trossachs National Park straddles the two regions of the Scottish Highlands and the Central Belt of Scotland, one of the four home nations of the United Kingdom. The park is divided into four distinct areas: Loch Lomond, The Trossachs, Argyll Forest, and  the Breadalbane. It's to the North West of Glasgow. The Loch Lomond and the Trossachs National Park became fully operational on 19 July 2002 and was officially opened by Princess Anne on 24 July 2002. The National Park encompasses around 720 mi² (1,865 m²) of land including the Loch Lomond area as well as the Trossachs region. Balloch at the south of Loch Lomond has trains from Glasgow Queen Street (low level platforms), taking about 50 minutes with generally two trains per hour. Garelochhead, Arrochar/Tarbet, Ardlui, Crianlarich and Tyndrum are all on the West Highland Railway, which is served by trains running from Glasgow Queen Street (main level platforms) to Oban and/or Fort William and Mallaig, in addition to an overnight sleeper train from London Euston to Fort William via Edinburgh. All of the above trains are operated by ScotRail . The A82 road up the shore of Loch Lomond is used by the Citylink  914, 915 and 916 buses (4-6 per day depending on season) from Glasgow to Fort William and the Isle of Skye. In addition, the summer-only 977 bus from Glasgow to Oban uses this route, heading west at Tyndrum. The Citylink/West Coast Motors 926 bus from Glasgow to Campbeltown go up Loch Lomond as far as Tarbet and then pass Arrochar and Cairndow on the way to Inveraray. The 976 bus from Glasgow to Oban also uses this route. During the summer, Citylink buses from Edinburgh to Fort William via Stirling pass Callander and Crianlarich en route. No permit is required to enter the park or explore on foot, by bicycle or by road. Permits may be required for fishing, or some boat use. The National Park Authority publishes a timetable of all the buses and ferries  which may be available as a booklet locally. Sightseeing trips by boat on Loch Lomond run from Loch Lomond Shores near Balloch. The steamship SS Sir Walter Scott offers cruises on Loch Katrine in the Trossachs. There are connecting buses from Callander and Stirling for some services. 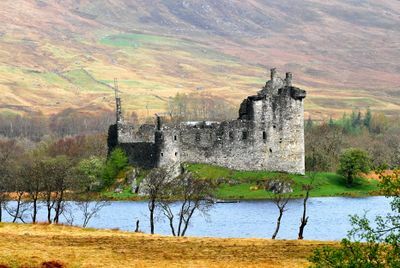 Kilchurn Castle has a four-storey tower and was built by Sir Colin Campbell in XVth century, 1st of Glenorchy. The ruins are some of the most picturesque in Scotland with spectacular views down Loch Awe. Location: North/east top of Loch Awe, 2.5m west of Dalmally via A85. This page was last edited on 21 July 2017, at 15:24.